Some Twitter users are not taking it likely and easy with President Buhari, prior to his comment he made in Germany when he was asked how he feels about his wife's, Aisha Buhari BBC interview in Hausa language. 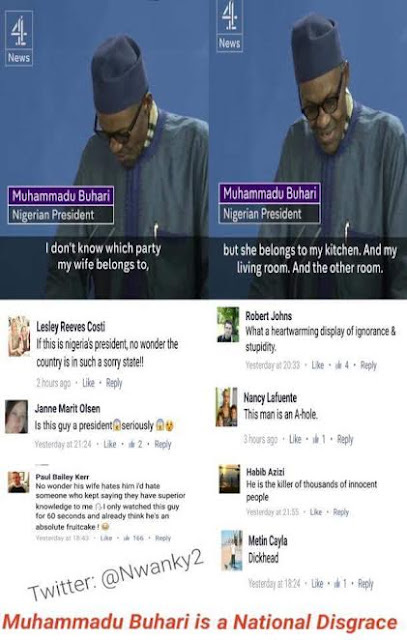 President Buhari jokes about it, by saying that the first lady belongs to his kitchen, his living room and other room. I am not President Buhari's fan or supporter, but i haven't seen anything wrong in the comments made by President Buhari. I saw it as jokes though. Mrs Aisha Buhari was right to say her mind and opinion about what is happening in Nigeria, and likewise President has every right to say anything about his wife and to also let people know where his wife belongs to, because she is his wife, she is nobody's wife, but President Buhari's wife. He can decide to make her full house wife and he can also decide to make her active in politics. Written, edited and published by Olusola Olaniyi - Publisher at Olusola Olaniyi's planet blog, Mariupol State University, Ukraine.